Kitara Farrar has burned up many a football field across the Far North over the last couple of AFL seasons. 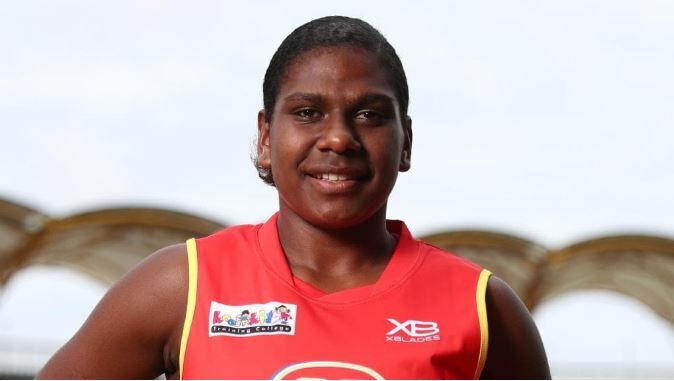 Come the 2020 AFLW season, however, it instead will be Kitara Whap-Farrar running out for the first Gold Coast Suns female season. The talented South Cairns product has been meaning to change her last name to Whap-Farrar for a while, incorporating her mother Emma’s last name, but has only just got around to it recently. Emma is the mature teenager’s drive and motivation to make it in AFLW after her battle with multiple myeloma for years. In her younger days, Torres Strait Islander Emma Whap was a keen sprinter but through her multiple myeloma, a cancer of plasma cells in the bone marrow, is restricted to a wheelchair these days. Kitara, the Cutters junior was destined to arrive at the elite level as soon as she was age eligible, dominating the AFL Cairns Women’s League over the past two seasons, winning back-to-back Jo Butland Medals as league best-and-fairest. After two huge years, which included finishing school, juggling work, travelling around Australia as part of the AFL Women’s Academy, Whap-Farrar feels being one of the three inaugural players for the 2020 AFLW season is all worth it now. “With my mum getting sick and having to get through all that, as well as having to leave my family behind and move down south, it is a lot,” Whap-Farrar said. “She was pretty sick a couple of years ago, but she is getting much better now. “Part of my drive is my mum, knowing that she was an athlete and she has had everything taken away and she will now be permanently paralysed. “I want to make sure she is happy. The Far North product was joined by Charlotte Hammans and Ellie Hampson as the Suns first signings, and will train over the coming months to prepare for next season. “From Charlotte on the Gold Coast, to Kitara in Cairns and Ellie in Townsville, there is so much talent coming,” Suns women’s footy manager Fiona McLarty said. Whap-Farrar will play for Bond University in the QWAFL for 2019 as well as for the Suns in the second winter series, before they enter the AFLW the following season. Kitara Whap-Farrar, Jack Bowes, Jacob Heron and Caleb Graham — the future is bright on the field for the current young generation of Cairns products. But, away from the oval is where the quartet may have their biggest impact. The mature four will all be excellent role models for those in the Far North to aspire to be like over the next decade. lJuniors come and try day!